Senior captain/point guard Marianna Jantzen (3) moves the ball up the floor out on the wing. Sophomore guard Kiki McIntyre (2) fights through a double team and puts up a jump shot. Entering Friday night, it had been almost a full calendar month since the Needham High School girls varsity basketball team had lost a game. 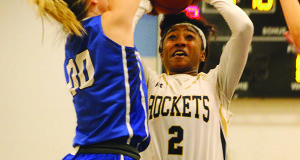 Ironically, that loss came at perennial Herget Division power Braintree (56-43) on January 11, the same team the Lady-Rockets (12-4, 9-4) were going to need to go through on Friday in order to extend their winning streak to nine games. 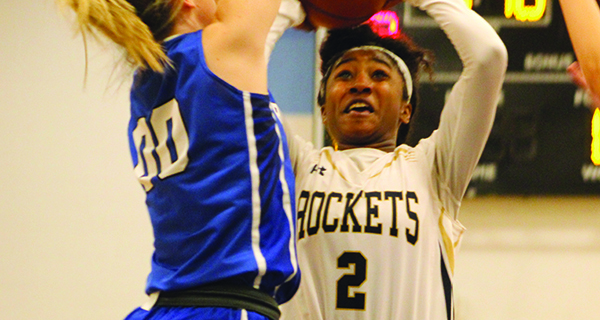 Despite a late rally by Needham, the Wamps (13-3, 10-2) were able to put away the Lady-Rockets with free throws for a 47-41 victory to clinch the Herget Division title, handing Needham its first home loss of the 2018-2019 season. The teams were neck and neck with for the entirety of the first quarter as the game entered the second tied at 10. Needham took its largest lead of the contest at 16-12 with 4:52 remaining in the half after a deep three-pointer by senior captain/guard Maeve Barker (six points), forcing Braintree to a timeout. Following the break, the Wamps responded with a 5-0 run to claim a 17-16 lead. A rebound and put-back by sophomore forward Caroline Klemm (nine points) gave Needham back the lead at 20-19 with a little over a minute to play in the half, but a layup off of transition at the buzzer by Braintree gave the Wamps a one-point lead at halftime at 21-20. Needham stayed within a point for the majority of the third quarter. With Braintree leading, 26-25, about midway through the quarter, the Wamps changed up their defensive scheme to force the Rockets to tough outside perimeter shots. The adjustment worked wonders, as it resulted in an 8-0 Braintree run to close out the quarter. The Wamps led by nine, 34-25, headed into the fourth. A layup by senior guard Taylor Frazzette (eight points) cut the deficit to 37-31 for Needham with a little over three minutes to play. Needham forced a turnover on defense thanks to a hustle play to save the ball from going out of bounds by sophomore guard Kiki McIntyre (nine points), followed by a nifty little bank shot by senior captain/point guard Marianna Jantzen (four points) on the ensuing rush to make it a four-point game at 37-33. Braintree extended their lead back to five points at 39-33 but a pair of free throws by Klemm with just under a minute to play made it a one-score game at 41-38. Needham forced Braintree to throw the ball out of bounds with 40 seconds to play. Braintree then made a stop, forcing Needham to foul as the Wamps sank a pair at the free throw line to go back ahead by five at 43-38. 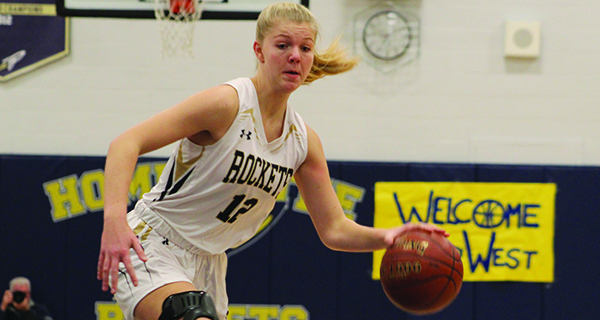 A big three-pointer by Frazzette on Needham’s next possession cut it back to a two-point game at 43-41 with 19 seconds remaining. However, Braintree was able to capitalize on its next set of free throws to go back ahead by four at 45-41. A three-point bid by Jantzen rimmed out on Needham’s next possession, followed by another foul and pair of made free throws by Braintree. The Wamps gutted out the six-point victory to take the Herget Division. Sophomore guard/forward Caroline Klemm (12) drives the ball to the rim. Needham will look to get back on track when the Lady-Rockets take on Westford on February 14.